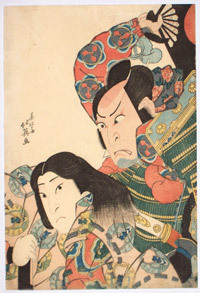 An hosoban showing the actors Ichikawa Danzo IV as Doi no Yataro (above) and Ichikawa Raizo II as Kojiro Masahira (below) in the play Kaomise Ama no Iwato, performed at the Nakamura-za theatre 11/1774. A fine design. Fine impression, colour and condition. Signed Shunko ga.
Fine impression. Particularly well preserved colour. De-luxe impression. Gum and polishing on Koganosuke’s hair; blind printing on the blossom above. Some loss of brass. 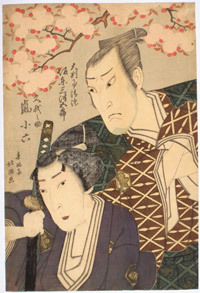 Signed Shunkosai Hokushu ga.
Iwai Shijaku I as Kowagi Atsumori and Nakamura Utaemon III as Kumagai Jiro Naozane in Gempei Tsutsuji, performed 2/1832 at the Kado Theatre. Published by Honya Seishichi. This is the second state of three: The first edition also has carver’s seal and various de-luxe embellishments. The third state lacks seals and has the actors’ names in blue top left ( one changed ) for a performance the following year 3/1833. Fine impression and colour. One flattened crease, otherwise very good condition. Signed Shunkosai Hokuei ga. Very good impression and colour. Slight creases and soil. 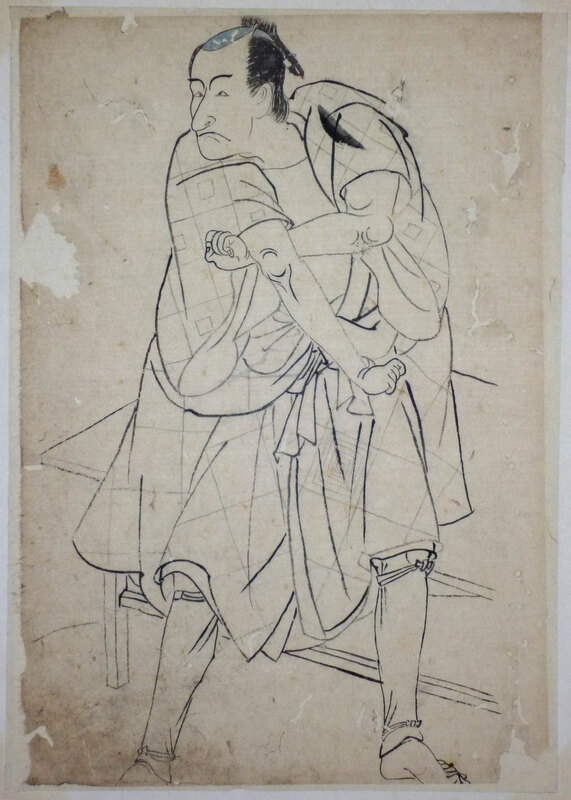 Signed Shunkosai Hokushu ga.
An original drawing showing the actor Ichikawa Danjuro V in an unidentified role. Drawn c mid 1780s. 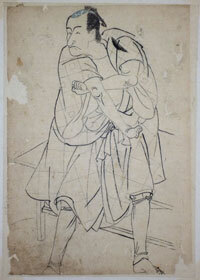 Such drawings from this period are very rare. Indeed, any prior to the 1810s are rare. Ex collection Tanizaki Junichiro ( the major Japanese writer: Tade kuu mushi, “Some Prefer Nettles,” etc ). And sold by the Kabutoya Gallery, San Francisco, c 1976. Guaranteed by Suzuki Juzo of the National Diet Library. Laid around edges, 9.5 x 6.5 in; 24 x 16.5 cms. Sold as is with some wormage etc. 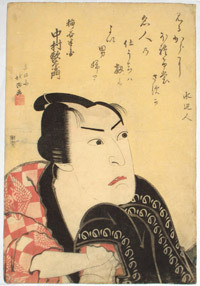 Ichikawa Yaozo III in a Shibaraku role c 1800. This standard Kabuki interlude was invented by Danjuro I as part of the drama Sankai Nagoya in 1697 and translates as “Wait a moment.” The long brick-red costume with the immense mon produced some of the most striking images in ukiyo-e. The best of Shunko’s work certainly equals that of his master and teacher, Shunsho. Provenance: Ex collection Dr. and Mrs. James B. Austin, illustrated in Eight Hundred Years Of Japanese Printmaking, Museum of Art, Carnegie Institute, Pittsburgh, 1976/77, illustration 326, p.79. Good impression and colour. Slight centre fold and minor marks, otherwise very good condition. Signed Shunko ga.
An original painting, sumi and full colour on silk, 32.25 x 10 in; 82 x 25.5 cms. An important print artist and his paintings being considered one of the glories of Ukiyo-e. 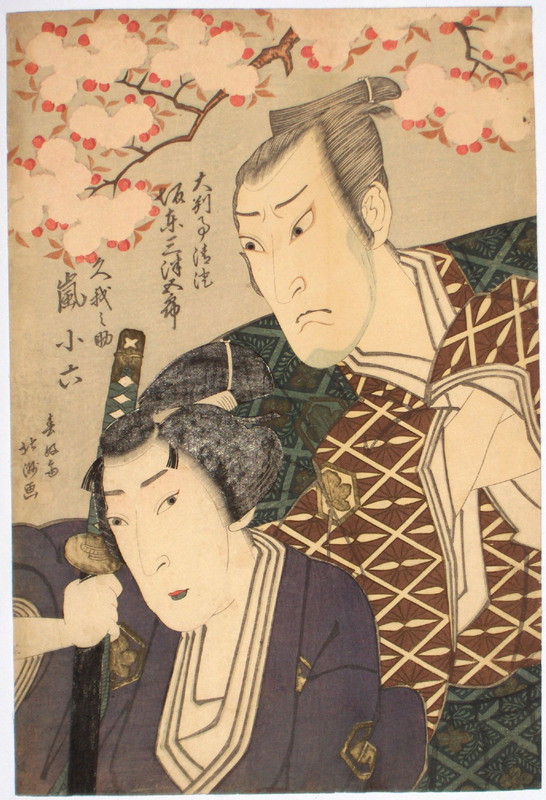 Produced a considerable number of hosoban actor prints from the late 1760s on as well as collaborating on the Ehon butai ogi illustrated book with Buncho in 1770 and Seiro bijin awase sugata kagami with Kitao Shigemasa in 1776. He had many pupils including Shunko, Shun’ei and Hokusai. Shows a court beauty reclining and reading a book. 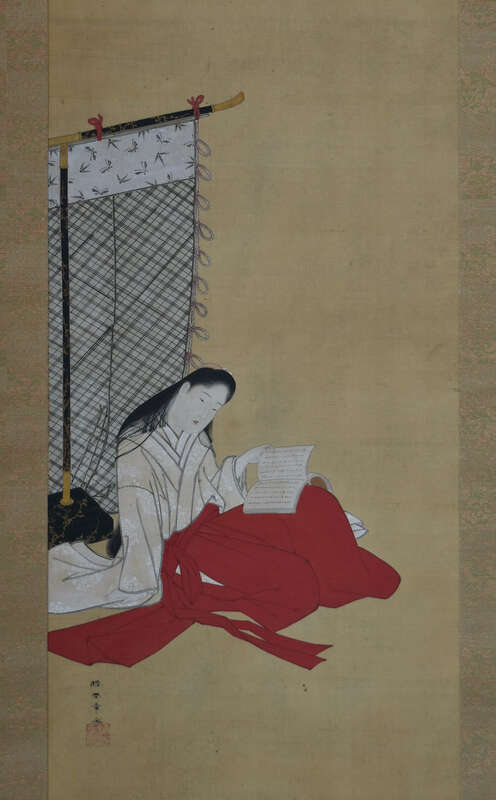 The painting of the face, hair and the lacquer stand holding the cloth screen are exceptional. Painted c. 1789. In very good condition. Signed Katsu Shunsho ga with seal Jui.